All of that belies a few simple facts, though: Bayliss-Wiley Co. Ltd. was a highly respected designer and manufacturer of bicycle components, ahead-of-its-time inventor of products employing honestly modern concepts, and bespoke component supplier to other British companies in both the cycling and automotive industries — for nearly a full century. Fuzzy background notwithstanding, Bayliss-Wiley has perhaps the most convoluted history of any bicycle-related manufacturing company ever to exist. Its lifecycle detoured the company into and out of motorcar production, at one point buying, then selling, then merging with another company, and finally being absorbed into Renold Chains Ltd. around 1959 before fading altogether a decade later. Renold, who designed the first effective bicycle chain, rather unceremoniously omits the Bayliss-Wiley acquisition on the company’s official website. The National Archives of England thankfully found the event sufficiently important to memorialize at their Manchester repository. Renold does note Brampton Brothers Co. Ltd., who later became Coventry Chain Co. Ltd., were also absorbed by Renold Chains Ltd., in 1925 and 1930 respectively. For its part, Bayliss-Wiley produced a range of much sought-after hubs, including the world’s first cassette hub in 1938, long predating today’s more recent releases of what is considered one of the greatest advances of contemporary cycling technology. To imagine a world without the reliability, performance and convenience of cassettes would be to imagine a world without Bayliss-Wiley. The company’s early history seems inextricably linked with that of Warwickshire-based Perry & Co., later Perry Motor Cars, Ltd. Perry was founded in 1824 to make steel nibs for writing pens. Late in the century, the founder’s son took over and diversified into bicycle component manufacturing to ride the first great wave of enthusiasm for bicycling, the Bicycle Boom of the late 1800s. Unfortunately, he was a bit late and caught only the tail-end of the boom. Fortunately, he hired James William Bayliss away from his father’s bicycle company, Bayliss-Thomas, in 1896 and tasked him with turning the bicycle components division around within three years. (Bayliss-Thomas had been making bicycles since 1874). By 1898 Perry & Co. had to expand the premises and by 1907 had bought an eleven-acre site in Birmingham, strong evidence of James Bayliss’ business smarts. In 1910 Perry decided to build automobiles and Cecil Bayliss (presumably a relative of James) was assigned to design them. They continued to build cars and apparently cycle components through 1918, when Perry Motor Cars was summarily dissolved. The tooling for automobile production was sold to A. Harper Sons & Bean, while Cecil Bayliss and Arthur Edwar Wiley bought the tooling for bicycle components. Bayliss-Wiley was formed from the remains of the earlier companies one year later, in 1919. Two short but successful years after that, the company relocated to its Tyseley, Birmingham location in 1921. Archival records perhaps erroneously indicate Bayliss-Wiley merged with then-no-longer extant Perry & Co. in 1926, which seems unlikely given the sequence of other documented events. On firmer ground is the record of its purchase by Renold Chains Ltd. in the late ‘Fifties. Bayliss-Wiley continued to manufacture bicycle components until 1969, when the trail ends — not with a bang, but a whimper. Perhaps coincidentally this was the same year Cecil Bayliss died. Perhaps not. Bayliss-Wiley was not a company that tried to be all things to all cyclists. They concentrated their efforts on a few key components almost every cycle would need. They then made them sturdy and functional, and judging from their pervasive presence among resellers, made lots and lots of them. 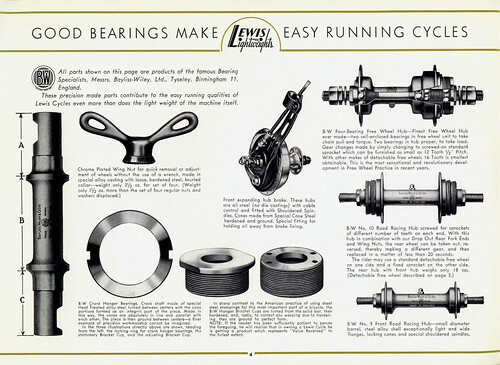 Bayliss-Wiley hubs, freewheels, “unit hubs” (the old term for cassettes), bottom brackets and cranksets comprise the strong majority of appearances when perusing old catalogs for the company’s products. Mentions of them on the various collectors’ forums are inevitably tinged with an affection one reserves for machinery that is highly competent but unabashedly modest and works well or better than well without invoking any glamour or mystique. Generations of cycle manufacturers seem to have had the same respect for the company, as many fine bicycles from multiple eras of the craft specified Bayliss-Wiley parts. Among them: Raleigh, Flying Scot, Dunelt (all British), and a US company named Lewis, as well as numerous others over the years. These multiple sources continue seeding a ready market for Bayliss-Wiley parts among the collector and restorer set, resulting in the marque’s surprisingly high profile in the online auction world. So what exactly did they make? As far as can be determined, Bayliss-Wiley concentrated on hubs of various sorts, freewheels (including that famous first-ever cassette hub), bottom brackets and cranksets. The cassette hub is of course their greatest claim to fame, one that came a good thirty years before Suntour’s first failed effort to popularize cassettes. The “Free Wheel Hub” is further touted as “the most sensational and revolutionary development in Free Wheel Practice in recent years.” Lewis was particularly enamored by the four bearing sets in the hub (two on the axle, two more in the freewheel itself) and its capacity to accommodate a sprocket down to 12 teeth. The Lewis Super Club bicycle on which this freewheel hub was offered also sports a Bayliss-Wiley “Spindle Racing Hub” on the front, with a Bayliss-Wiley drum brake hub as an option. Other Bayliss-Wiley product options that Lewis offered included a fixed/fixed rear hub (the “No. 10 Road Racing Hub”) and bottom bracket. In sharp contrast to the American practice of using sheet steel stampings for this most important part of a bicycle, the B-W Hanger Bracket Cups are turned from solid bar, then hardened, and, lastly, to correct any warping due to hardening, they are ground to perfect form. That this is not hot air can be evidenced by the large number of bicycles in current use still powered by Bayliss-Wiley bottom brackets. Their photographs populate the bike gallery provinces of the Internet to a greater degree than might be expected given the brand’s present day obscurity. Perhaps this represents a business opportunity to someone, somewhere. Maybe even to one of those contemporary Bayliss-Wiley couples that are all over the Internet. 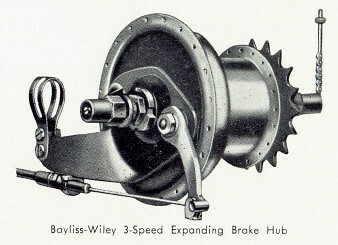 Another original Bayliss-Wiley product was a three-speed internally geared hub with integrated drum brake, the latter being a cable operated mechanism without backpedal feature. The hub listed for three dollars more than the Sturmey-Archer three-speed hub also listed in the Lewis catalog, despite a credit given for the removal of the now-unnecessary rim brake. Bayliss-Wiley racing hubs came with oil ports to facilitate lubrication and featured locking cones, leading one to wonder whether axle locknuts were another company innovation. In a demonstration of commitment to discipline, their fixed/fixed hubs came equipped with wingnuts to facilitate quick gear changes. It was also noted the Bayliss-Wiley singlespeed freewheel could be fitted to the racing hub. Bayliss Wiley are excellent quality and far easier to obtain [than Chater Lea]. My 1962 Holdsworth Aids has a note to the effect that BW had just ceased trading… Until 1953 BW only produce a [non gear case clearance ie for single sprocket on the rear] axle plus a range for roadster and carrier bikes. Responding to increasing use of gears by British riders they introduced: – two longer axles – a featherweight set to compete with continental design(still all steel) The latter weighed in at 310g some 50g (2oz) lighter than a convention set. This was mainly achieved by making the axle hollow. The adjusting cup had a hexagonal adjustment and the lockring had 8 notches. Beautifully polished: as good as anything from Europe. Unfortunately for fans of good European things, 1953 spelled the beginning of the end for Bayliss-Wiley. Production continued until around 1957 and company activity endured through 1969. Why did the operation, so steadfast yet so innovative, die out? 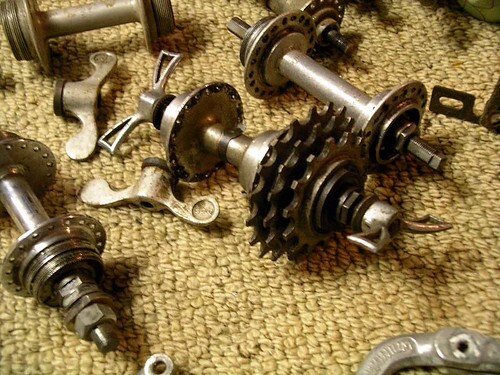 Was it the increasing prevalence of Campagnolo componentry, the move to derailleur gearing by racers, the fall into a thirty-year somnolence of club racing in the US, a diminishment of interest among the principals, or simply whiplash from too many buyouts? Wherever the truth might forever be buried, Bayliss-Wiley followed the footsteps of many other pioneering British manufacturers who ambled off into obscurity after a long career illuminated with flashes of engineering brilliance. If what The National Archives records indicate remains true, the company and its spirit found an eventual but comfortable resting place with Renold plc., an international engineering group with employees in 23 countries. The products Bayliss-Wiley made during its nearly hundred-year existence, those wee bits of metal so essential to the experience of bicycling, still live on — in use and increasingly sought after. They may even outlast their latter-day competitors who have already forgotten Bayliss-Wiley ever existed. Hi, A great source of B-W information. From what I have gleaned from adverts. in old cycling mags. I believe that Simplex beat B-W to the punch re. the unit hubs with their hex or octagonal one (which was closer to a cassette since the sprockets slid on rather that being screwed on). Also I think the unit hub was first advertised as a Perry hub, I have an old advert. around somewhere, that I will try and find. I would also assume that B-W made the unit hubs that Cyclo sold. Damn! That’s awesome! You won’t find that stuff at the fixed gear gallery. Hirondelle’s Retro-Direct free-hub may predate Bayliss-Wiley’s. Thank you for posting this excellent, well written information regarding a great MFG most of us have never heard about before this. Thank you for this wonderful article !